Lexis Deshazor-Burnett, a rising junior at North Carolina A&T State University, credits the George Washington University (GW) Summer Program Advancing Research on Cancer (GW-SPARC) with opening her eyes to the myriad research paths she could follow. Becoming a doctor was always her goal, she said, but once arriving at college, Deshazor-Burnett discovered a new passion: research. Through GW-SPARC, she spent the summer in the lab of Alexandros Tzatsos, MD, PhD, assistant professor of anatomy and cell biology at the GW School of Medicine and Health Sciences (SMHS) and researcher at the GW Cancer Center. She assisted with using CRISPR, a revolutionary gene editing tool, to knockout KDM6A, a histone demethylase, in pancreatic cancer cell lines. New to GW this year, the program is open to undergraduate school students from groups underrepresented in biomedical science and provides participants with a hands-on approach to cancer research. Students worked in laboratories focused on cancer immunology and immunotherapy; cancer biology, namely targeted therapies and epigenetics; and cancer engineering and technology. The goals of GW-SPARC, according to Alison Hall, PhD, associate dean for research workforce development and professor of neurology at SMHS, who serves as co-director of the program, are to expand opportunities for potential researchers and enhance diversity in the biomedical research community. “GW-SPARC not only exposes participants to cutting-edge research and contemporary cancer research techniques, but also fosters their understanding of health disparities and the impact of cancer in different communities,” said Hall. Students attended workshops on topics including sample size and experimental design, applying to graduate and medical school, and how to make a research poster. They also sat in on seminars from GW Cancer Center researchers, such as Katherine Chiappinelli, PhD, assistant professor of microbiology, immunology, and tropical medicine at SMHS; Norman Lee, PhD, professor of pharmacology and physiology at SMHS; and Edward Seto, PhD, associate center director for basic sciences at the GW Cancer Center, King Fahd Professor of Cancer Biology, and professor of biochemistry and molecular medicine at SMHS, who is also a co-director of GW-SPARC. Ann Obi, a rising junior at Prairie View A&M University, worked in Chiappinelli’s lab over the summer. She first was drawn to medicine after visiting family in Nigeria during a summer break in high school and realizing the lack of health care services available there. Obi said working in Chiappinelli’s lab was an exceptional experience. 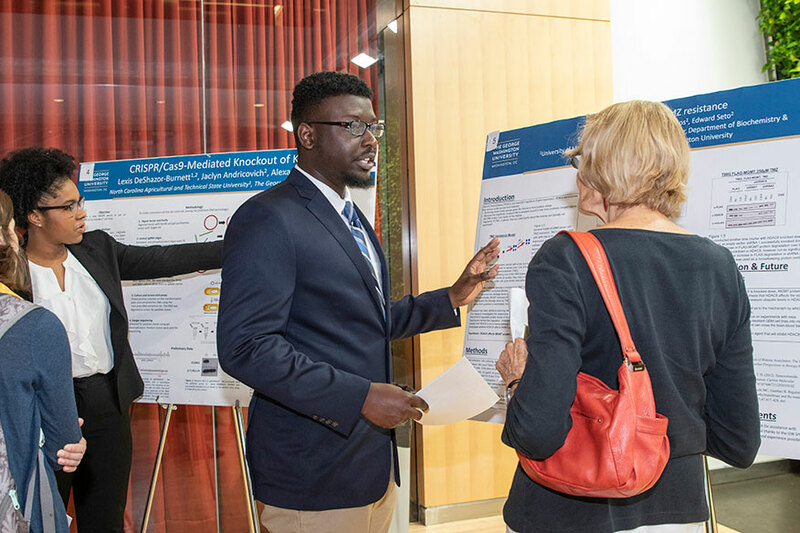 In addition to their time in the lab, cohort members also were required to create a poster on their research and presented their findings to faculty and staff on the last day of the program. Obi confidently presented her research to the crowd gathered in the Science and Engineering Hall that day, answering questions with a confident smile. Before the presentation began, Hall and Seto said a few words to the students and attendees. The GW Hospital Women's Board provided partial support for this initiative.